The marble group Hercules and the Centaur Nessus is the visual focus of the first corridor and represents one of the most remarkable examples of integration of ancient fragment by Giovanni Caccini (1565-1613), celebrated Tuscan sculptor remembered for his activity in Palazzo Vecchio, the Church of Santo Spirito and the Boboli Gardens. 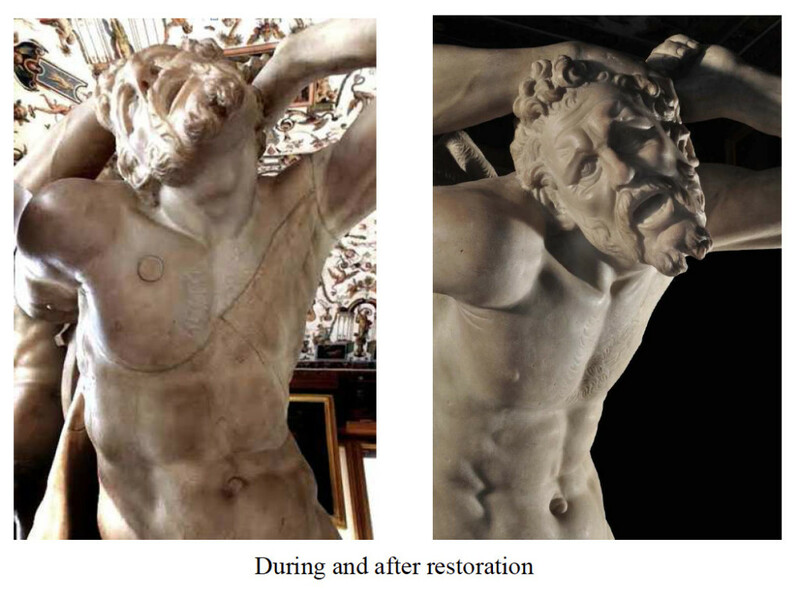 The restoration works of the group of Hercules and Nessus, which lasted four months and were masterfully carried out by Paola Rosa, required outstanding diligence and commitment and became an opportunity to study and understand the artwork through extensive surveys. Every phase of the restoration was meticulously through a meticulous photographic campaign. Initially, it was essential to carry out a detailed mapping to discern the original parts from those integrated in the sixteenth-century restorations. 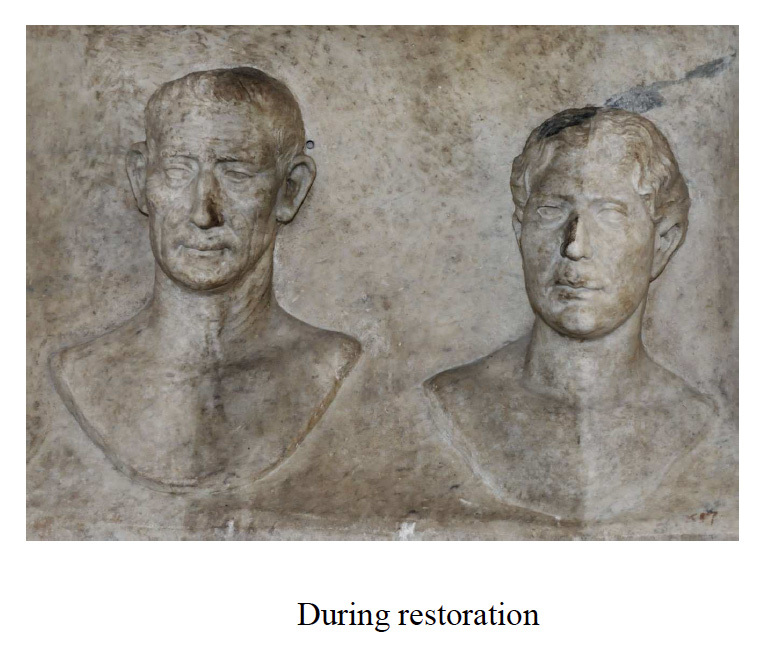 Vital for this was the support of the known documentary sources and of new diagnostic tests aimed at the categorization of some of the marble fragments. The mineralogical-petrographic analysis revealed the origin of the marbles: Docimium marble for the older part and Carrara marble for the modern figure of Hercules. 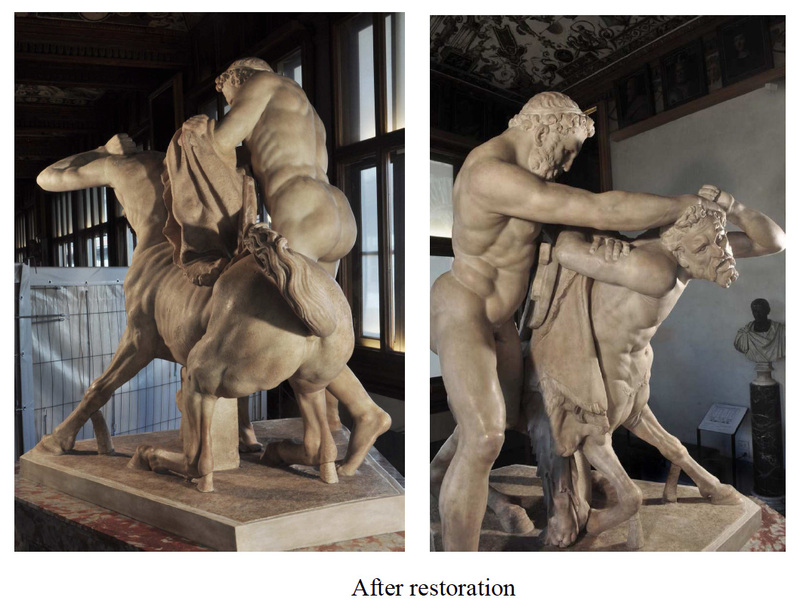 Careful observation of the various integrations allowed to distinguish two restoration interventions on the artwork: one performed in Rome by some Maestro Silla, who recomposed the original fragments and added the central support and props under the four hooves; the second carried out in Florence by Giovanni Caccini consisting in the integration of the statue of Hercules, the upper part of the centaur, its arms, part of its legs and the tail. 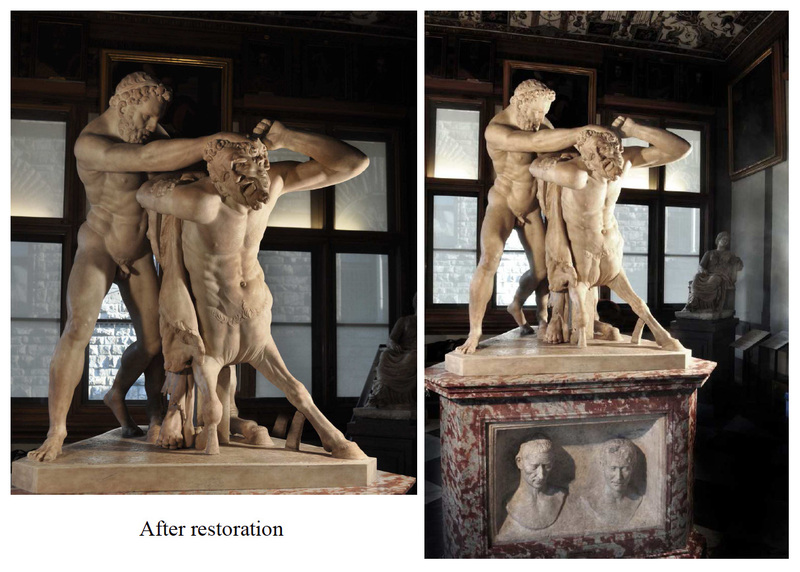 Several traces of a thorough reworking have been identified on the surface of the base, allowing for a more faithful reconstruction of what was to be the original appearance of the sculpted group. 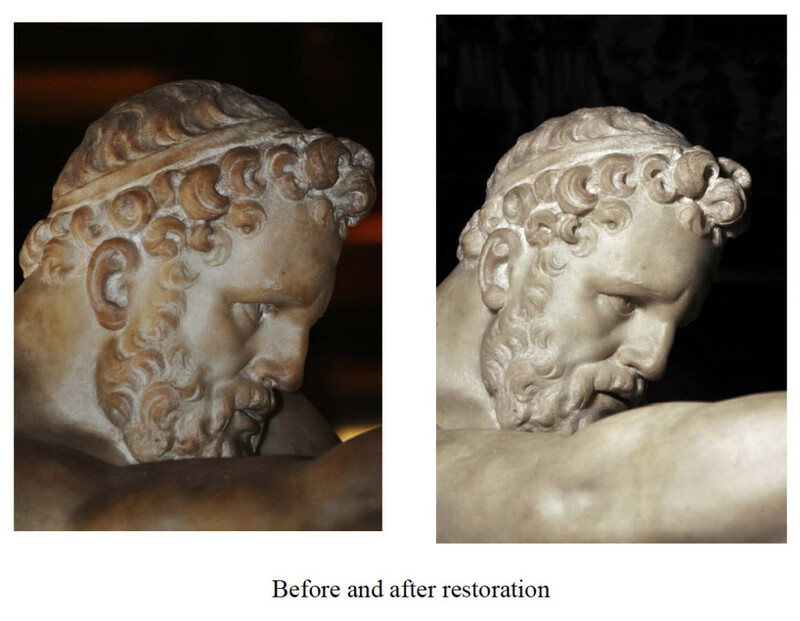 Prior to restoration, the sculpture had a dull and rather dark coloring due to the presence of abundant deposits of dust and superficial dirt combined with old maintenance wax that concealed scratches and abrasions, in contrast to the many clear and dry undercuts. After some preliminary testing, cleaning was started with repeated localized cotton swabs alternately soaked in deionized water and white spirit. 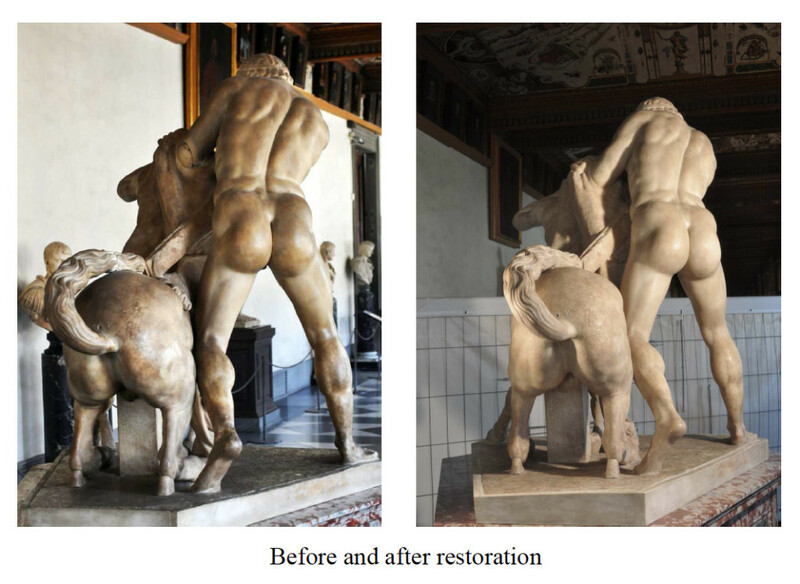 It was difficult to find the color balance between the old part, with a surface marked by corrosion, and the modern Hercules and upper portion of the Centaur, with a surface which is smoother and now irreversibly stained by drying oils used to coat the new marble. The old fillings between the recreated and integrated parts and the residues of old colophony resin, were manually removed with a scalpel. All of the fillings have been replaced with a mineral crystal-based stucco to imitate the modeling of the original surface and then camouflaged with meticulous painting retouch with varnish colors. The aim was to restore unity to the whole group by trying to achieve both a balance in color and a satisfactory smoothness of the surface between the original and the integrated parts, in order to improve the aesthetic reading of the work. 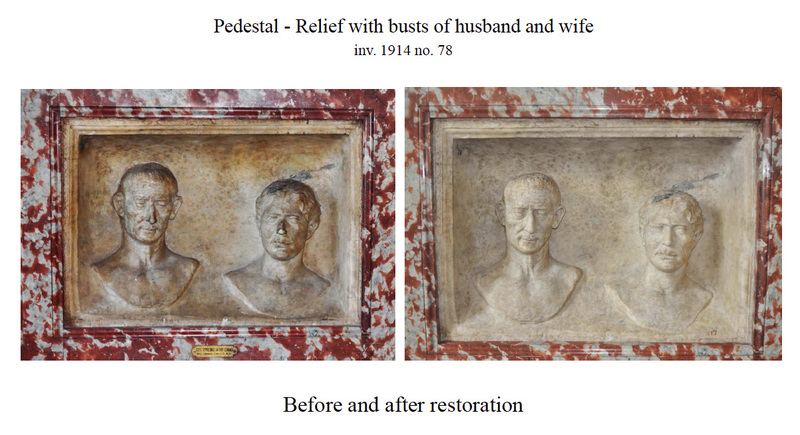 The relief shows the effigies of a married couple ment to be inset in sepulchral monument. Provenance and past history of this work are unknown. The work is not present in inventories prior to 1753 and seems to have entered the Gallery after 1769, when it is first recorded. 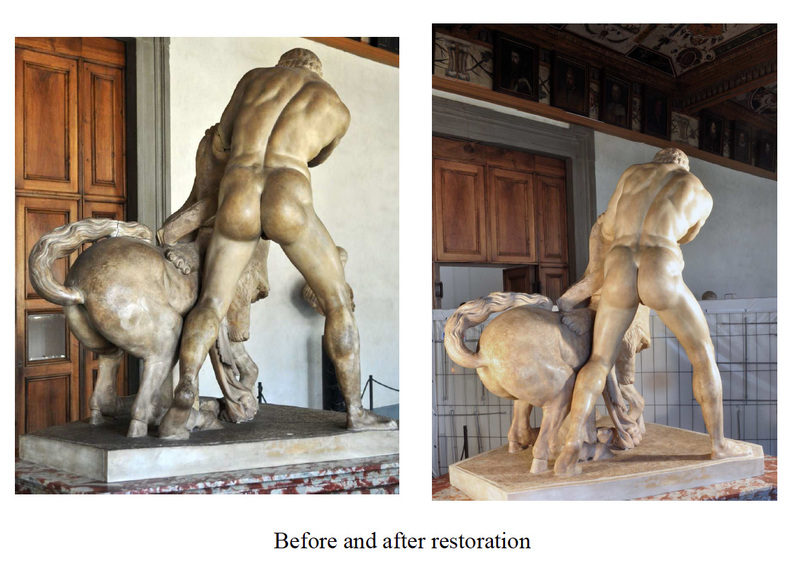 Ever since 1780, the relief has been associated with the sculpture group of Hercules and the Centaur, first inserted into a wooden base and then into the present portasanta marble pedestal . Obscured by abundant deposits of superficial dirt, mostly wax and dust, which gave the work a dull and dark look, the surface showed abrasions and small gaps. 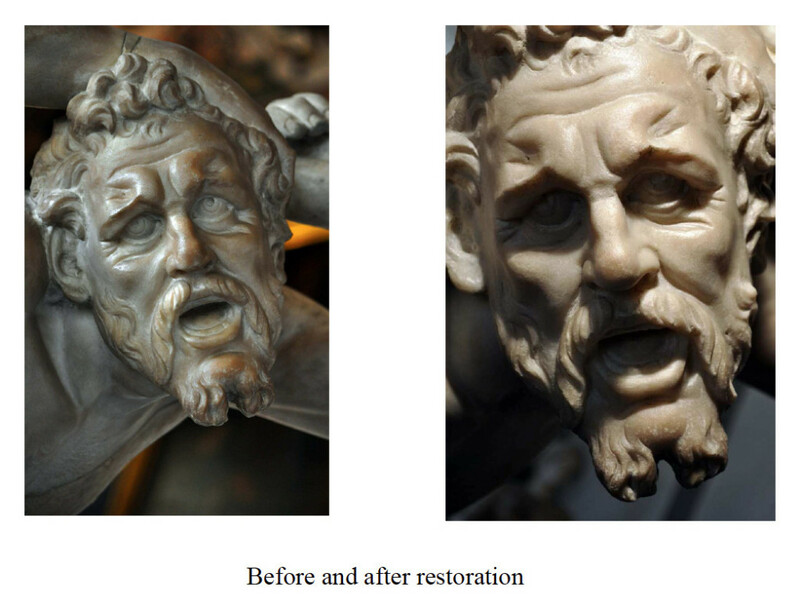 During the cleaning operations, performed with localized alternated swabs of deionized water and white spirit, traces of colour came to light: Egyptian blue in the background and especially the irises of the eyes of both figures. Interesting was the discovery of two circular holes, filled with grout, on the sides of each head, which probably served to accommodate two metal coronets, presumably in gilded bronze, laid over the hair, Once freed from chalk, the holes were lightly stuccoed so as not to hide their presence.